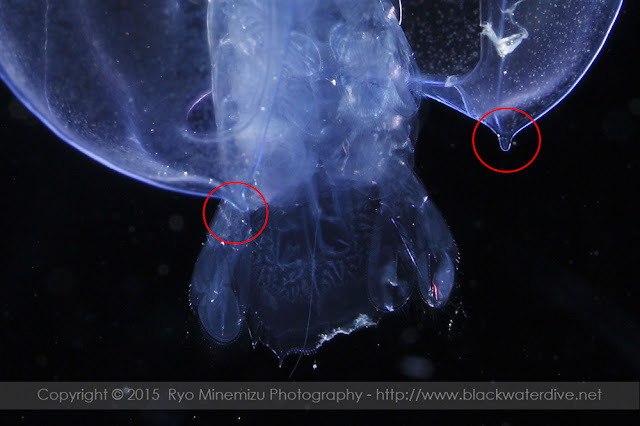 It appeared in the Black Water Dive® in Kume Island I went the other day, About larva of Mantis shrimp with the shell of a unique shape, Discussion of the write some. Vertical length of the about 45mm. 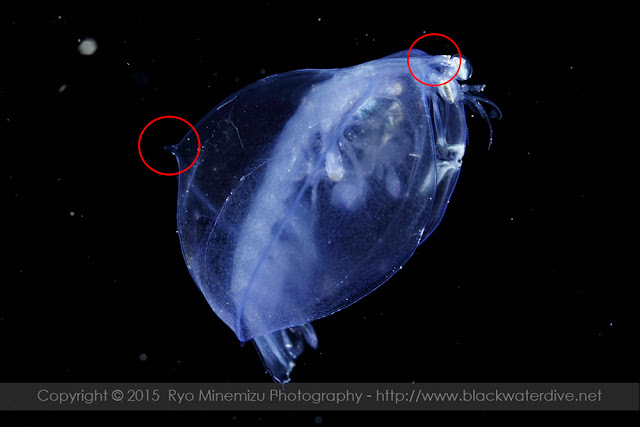 Swim of this mantis shrimp larva is not faster than other mantis shrimp larvae. It's just floating like a balloon. Most of the body, it has been protected in this shell. The shell has ridge line on back and side. This specimen has Rostrum and Median spine. However, It's look like a little defective Rostrum in this individual. Probably, the original rostrum slightly longer than this photo. And, there has shorter and obtuse of Postero-lateral spine. Carolin Haug & Joachim T Haug, 2014. Defensive enrolment in mantis shrimp larvae (Malacostraca: Stomatopoda) Contributions to Zoology, 83 (3). Sidney Joseph & Townsley, 1953. Adult and Larval Stomatopod Crustaceans. Occurring in Hawaiian Waters. Pacific Science, Vol. VII p399-437.